I haven't heard of anyone else working on the 07/08 Suzuki Bandit ECU, so I'm going to see what I can accomplish with it. I've picked up a tremendous amount from this website already, hopefully I can put it to good use when I find a donor ECU for that first download. Thanks everyone for your efforts here and the knowledge you've gained and made public! I never would have had a chance at tweaking the ECU on my Bandit if it weren't for the info here to get me started. I'm assuming the CPU is going to be an SH7052, but I'm having trouble finding the pinouts for that CPU on the Renesas website. I need to find the reset, FWE, etc. Is this CPU the same as the 7050/7051? See section 1.3.3 Pin Assignments. I don't have any idea what the email problem with Renesas is. I got mine right away. As soon as I can get hold of a cheap ECU I will start taking the thing apart. Have you managed to get anywhere with this? I haven't gotten anywhere with this, I'm still looking for a 1250 ECU. I just started looking for a cheap gsxr/busa ecu in the meantime so I can get it pulled apart and get a propeller hooked up to it to pull down the original map. I know this has been done already, but the experiance I gather doing it myself should go a long way when I'm finally working on the 1250. On SDS, you may want to check out the USB device names if not already done. If its something else than OEM FTDI names then you may have an issue. I have a GSXR 600 ECU on the way to me now. I expect that when I plug it in to my USB/TTL interface it will communicate just fine with the SDS software. This is just a gut feel right now, but I think the problem with the Bandit ECU communication is that there is no true Rx/Tx. I think the "serial data for self-diagnosis" on the bandit is setup the same way the "serial data for speedometer" is on the GSXR. It is not Tx data from the ECU, and can't be connected that way. I also am doubting that the dealer mode switch wire doubles as an Rx. Why would these lines be created to act that way when a pure Rx/Tx could be used, and already exists, such as on the GSXR? The GSXR has the Rx/Tx, AND the serial data and dealer mode lines. I'll know more once I try the GSXR ECU with my current setup. I found a 1250 ECU today! I'm still going to work with the GSXR 600 one first and get my feet wet, but then it'll be onwards to Banditopia. Any chance you plan on documenting the SDS communications protocol and posting it? If you did than we could write our own PC software or adapt the RomRaider Logger to use it and bring SDS to the masses without having to distribute bootleg copies of Suzuki's software. Yes, I'd like to do that as well. If fact, my original goal was to write some simple freeware programs that could be used with a $20 USB/TTL adapter to reset fault codes, ISC learned value, etc from the ECU without buying the $800 suzuki SDS package. Once I found your site I got inspired to hack the ECU and see what we could get out of the bandit. So now I guess I have two projects. Actually maybe three...I was also wondering on the way home tonight if bandit owners could flash the more available GSXR ECU's with Bandit maps and with a harness adapter use the GSXR ECU instead. It's good to have two ECU's - one street (emissions tests), and one track. But with the cost of used bandit ECU's, if you can even find one, that's not an option for most. No such thing as dumb questions. We actually have the code from a number of Suzukis with SDS so we could develope the protocol from the inside out. But it would help and probably go faster if we had a rough idea of what we were looking for as far as packet size and handshaking. Yes, the old compuserve days, when you could type faster than your connection could send it and echo it back to you. There is still stuff floating around on the internet out there from old compuserve Tandy Users groups that I wrote about hacking the M100s back in the mid '80s. God I feel old some times. Well, I'm off to a rather depressing start. I imagined the SDS communications to be similar to the gauge bi-directional serial on the Gsxr. I setup a propeller to translate my 9600 baud comms to the 7812 baud I figured was needed but have had no luck with talking to the ECU. Even the SDS software does not see the ECU. I tried various combinations of inversion, open gate, pullup resistors, etc but cannot get anything going. The Gsxr ECU I bought to experiment with was not even shipped for a week and I got the Bandit Ecu beforehand so I started on that. Pulling the case off was a lot harder than I expected and I wish I had learned on the Gsxr case because now I know not to try and take it off in two halves. It's safer to nip it off in chunks until the case is out of the way. I really don't need the case. When I took the bottom off the Bandit ECU I used a flat blade between the case and the potting compound, but must have hit an SMD capacitor at one of the corners. I was concerned when I saw it, but it did not look broken so I ignored it. It fell off at some point later though and I don't know it's value. I used the same technique on the upper cover and due to the height of the electrolytics managed to hit them. Their sides show some denting. Once I had the bottom cover off (and the SMD cap was still attached) I plugged the ECU into my bike and started it. All was well. Now that the smd cap is missing and the electrolytics are dented the fuel injection does not come alive when the bike is powered on. The SMD cap is connected to the ground leg of a hex inverter (74HC04A) but does not seem to go anywhere after that. There is another capacitor on the hex-inverter's ground leg which takes it to ground on the other side of the board. So I can't see what the missing cap did in the first place. Are these multi-layer boards? The electrolytics are not seriously damaged but one has a good 1mm dent in the shell. I'm not sure if this is enough to disrupt the power supply on the board (which I assume it's for...100uf, 35v), but I guess I'm hoping it is, or that the missing smd cap took out the hex inverter which killed the FI. 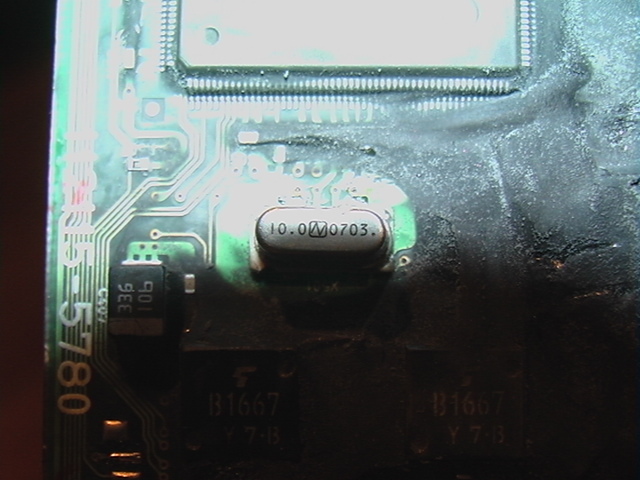 My question is this: Can the dented electrolytics cause any damage to the rest of the circuitry? I am tempted to replace the SMD cap and then try the ECU again on the bike. But if the electrolytics can cause damage to the rest of the circuitry if they are shorted (reduced capacitance, not to ground) I don't want to try anything until I replace all the suspect parts. My single greatest concern at this point is getting the board safely powered up and downloading the map. After that I can continue to clean the board and trace out the pins we need to know for flashing. Again, lack of experience here...but I wish I had just cut the hole for the AUD connector and pulled the map before doing anything else. The SMD cap from ground is a bypass cap. It is very common to put small (.1 to .33uF?) caps across the power and ground of logic ICs to filter out power spikes caused by the fast switch times of the logic gates. While it is needed to prevent erratic operation I really doubt its removal would disable the fuel injection. If I were you I would not install it on the bike and do any more testing. The wire harness provides to much current to the unit and if there is something wrong with it could permanently damage the board. Next time you power up should be on the bench with some kind of current limited power source. 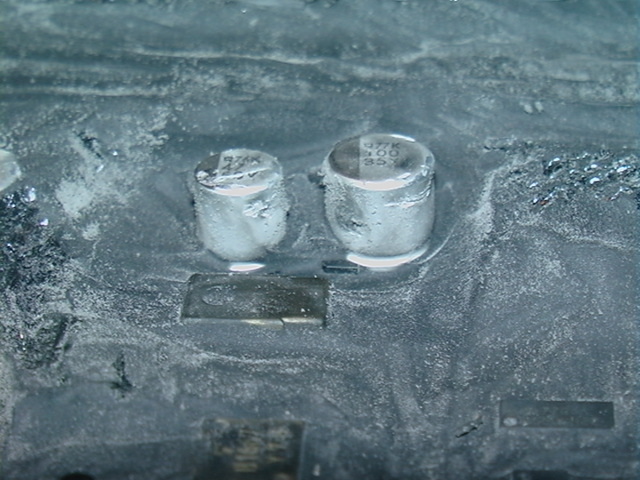 Dented caps can cause internal shorts in the caps that can greatly reduce their capacitance or short them out completely. It is also possible that you have just pulled one end of the cap off the board so that it is out of circuit. The good news is that as long as the 5V power supply works you can still download the code. The bad news is those big caps are probably part of the 5V power supply. Did you get any indication the ECU was running at all? Fuel pump turned on? Anything? I would concentrate on clearing off the back edge of the board (opposite side from the wire harness connectors). That is where you will most likely find the AUD port if there is one. I didn't mention it, but I did find the AUD port. I was just afraid to go further once I found out there was some damage already. The fuel pump does not turn on, which was an obvious sign of the problem. The readout on the bike does say CHEC when I powered it on, which is normal when the bike is powered on but not started. I wonder if that comes from the ECU? I can find out tonight - I'll turn the bike on with no ECU. If that message is not there I'll know my ECU is still partly alive. What is a good current to start with? 25mA? Is a resistor sufficient for current limiting or would i need something more elaborate? A normally functioning ECU draws between 200-250mA. I would say a 25ohm, 2 watt resistor would be good to start with. Measure the current and if its less than 300 mA you should be Ok. I would just go to an electronics store and buy an inexpensive wall transformer that is rated 12VDC and around 300-500mA. These are nice because they are kind of self limiting by the fact they can't deliver much more than their rated output. Once you get it powered up use a meter to measure the voltage across the ground and V+ pins of the AUD connector and see if you have 5 volts. Turned my bike on and found out it says CHEC even with no ECU attached. Not a good sign. But things got better. I put power to the ECU and found a lovely 4.99v at the AUD port. I'm a happy dude... RR, thanks for the wall transformer idea! Now it's time to hook-up the propeller. Propeller is hooked up and I'm using Bozo's program to run it. The only alterations I made were to lower the initial 10 second delay to 5 seconds, and to use different available pins on the propeller. Bozo used 0-7, I'm using 10-17. Is your propeller running at 3.3V or 5V logic? It's 3.3v. I have it setup identical to what bozo did including the 1k resistors for the data lines and the one to pull RST high. I've triple checked the wiring, tested for shorts, and examined all the joints and the cpu pins with a 60x magnifier. I'm going to setup another program on the propeller to step through it with more debugging. Hopefully that will shed some light on the problem. I'm getting the same 0000000F back before any command is sent, after the spare bits are sent, and after the read command. It also doesn't even matter if the RST line is tied high or not....same results. Although once I got 00000005 back ten times in a row after changing the starting address from 00000000 to 00A98ABC, I've been unable to duplicate that. It looks as though I have 2 problems. First is that the Bandit ECU is malfunctioning, second is that the propeller and AUD Probe program are not working correctly. I'll be working on getting the program straitened out before I go back to trying to fix the bandit ECU. BTW, is the map for the 06-07 GSXR 600 already known or should I post it? Specifically which ECU, 32920-???? ?, are you talking about? I already have that ECU but have not posted it publicly. BTW I think some of your nibbles are backward. This is what I have for the section of memory you posted above. I think maybe you are using an older version of Bozo's software. Thanks again RR, I've got the nibbles fixed. Now with the propeller working right, I've got to get the Bandit ECU online. That missing SMD cap probably has nothing to do with the hex inverter, it's just that one end of the cap connects to the same ground trace the inverter does. So, not knowing what it does, how do I arrive at a value to start testing 0603 ceramic SMD caps with? If this were resistance I would start high and work my way down until I saw results. What do you guys do for capacitance? Start low (like .01) and work up? A small cap like that I doubt the value is that critical. Besides I really doubt that cap is the problem with your bandit ECU. All you really need to get the AUD to work is power, clock, and reset. All the ignition, injector, and sensor circuits could be really messed up and you would still be able to pull code off of it. Do you have access to an oscilliscope? I would check the crystal to make sure its oscillating and check the reset isn't being held low before I worried about that missing cap. You're right RR, I knocked one side of the crystal loose. 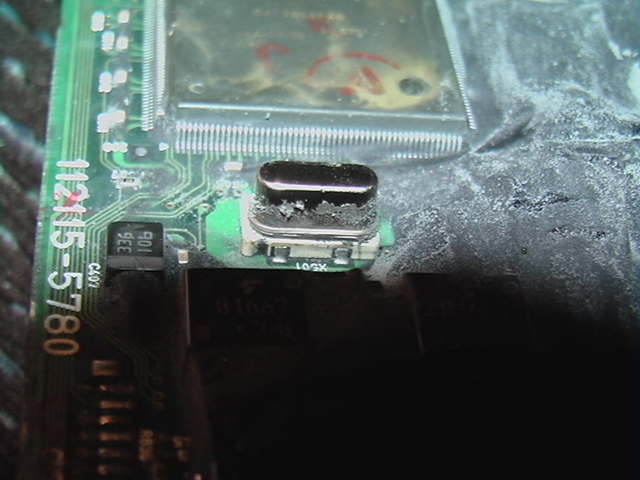 I don't have SMD equipment to get the old one off the board cleanly, so rather than risk the board trying to maybe fix this crystal from underneath, I'm going to finish breaking off the crystal and then nip off the plastic base so I can unsolder the contacts. I'll need a new crystal though. Does anyone recognize the case type here, or the manufacturer of the crystal? I can see it's 10Mhz but that's about it. I though it might be an oscillator being that it has 4 pins, but it appears that the pins go strait through from side to side..meaning there are only 2 electrical connections even if there are 4 points of contact. Or maybe I should leave the base alone and just solder a wire leg crystal to the pads? I'm a little confused. Is this a thru hole crystal or is it surface mount? It looks like surface mount. 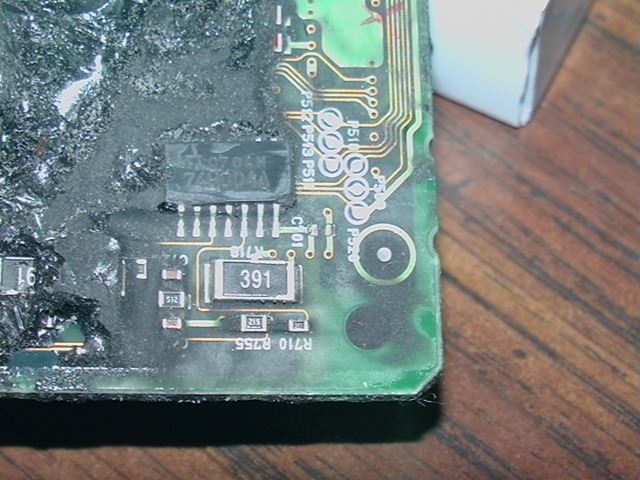 you should just have to reheat the pads and apply a little solder. Or are you saying that the crystal has detached from the white surface mount base? BTW I think your efforts have earned you your own Bandit 1250 forum under Suzuki. Hey, us hooligans are moving up! Thanks for the new forum. On the crystal, yes it is SMD and one end is broken loose from the mounting base. The broken end will swing clear of the base so you can see the leg underneath that it used to attach to. If I can't find the identical crystal, my thought was to detach the crystal but leave the mount base and just solder a wire legged crystal to the legs of the base. Do you happen to recognize the manufacturer symbol [/\/] on the crystal? The manufacturer really doesn't matter. We can look at the CPU datasheet to find the crystal specs and order from that. As your not going to put this back in the bike you can just get a thru hole crystal and tack it on to the circuit board. It will be a lot easier in this circumstance to just bend the leads and solder them where they go then try to find the exact same SMD crystal with the right pin foot print. Here is a very preliminary RomRaider xml definition for the file above. I did find one oddity. The single map in x23y40 is something I have never seen in any of the other bikes. Anyone have any guesses? BTW for the record does this bike have a model number like GS1000 something? Also this is a US market bike? 32920-18H20 is a K7/K8 California model. Could you please copy the 1250Bandit bin to your server and set a link to it. I have no access to Gadget´s link on easypath.com. As an additional note, although called the california model it seems to be the only model available in the US. Blackgixxer, if you let me know your email address I will zip it and email it to you. RR, thanks for the xml. I was looking into using your bin2xml, but I didn't know the starting location. Is this a common address, or what types of things would I look for to determine this in the future on other ECU's? Did you identify a map and then look around for what referenced it? All the 32bit Denso's I've looked at pretty much follow the same pattern as far as memory. You have all the code starting at 0400. At the end of that code is a bunch (100+) of 32 bit addresses that are the look up table for all the telemetry values. Following that will be a blank spot filled with FFs. Then on an even boundry address the map table will start. On the Busa that was 0x00028000. Address 0x0002C000 is also popular. Yours was 0x0002B800 so it was between those two. RR, the model number for the Bandit is GSF1250. Could the extra map be for the secondary butterflies? We know from dyno runs that the butterflies are limiting the power to 100 hp. They cause a very distinct dip in the graphs. My work laptop has gone back for repairs so I am without a windows pc this week.....Might have to get an emulator for the Mac working before I can see the maps.... Doh! Pin 20 of the ECU (STP sensor) runs to AN6 on the CPU. That memory address (FFFFF80C) is only referenced a couple of times in the code at 3688 and 3C14. What I need to do next is figure out what code is interested in the value of this location and add a sub to tell that code what it wants to hear in order to avoid branching out into an error condition. I'm still working on being able to read assembly and make sense of it all...so this might take a little while. Pins 1 and 2 of the ECU (STP motor) run to pins 9 and 16 of IC810 which is an SOP24 device marked SPF7211 and SK7209A. Unfortunately, I can't find any info on it so far. Knowing the inputs would make it easier tracing them back to the CPU. Does anyone know anything about this chip? At power up the ecu powers the secondaries to sweep from fully closed to fully open and back again. Then a 'map' is used to determine the position of the secondaries throughout the rev range. Ending with a partially closed throttle at ??rpm. Has anyone ever found the code/maps/workings of any bike with secondaries? I know the gixxers/busa's just pull the hardware out. Are the secondaries controlled by a stepper motor? So would the ecu step until a certain number of steps have been completed or does the STP sensor have to be a certain value? If the weather was a bit nicer I could fool the STP sensor with different values to see how that affected the STP position. Always more questions then answers.....glad this site is here and the great people that get things done. may be the STV tables. The quickest way to find out would be to just put 100% in all the cells of one of the maps and see if it the secondary opens all the way and stays there. BTW There are 7 maps, one for each gear and neutral for each MS0 and MS1 for 14 total. The gear maps look all the same but different from neutral. I'm not sure which MS is stock on this bike so I would change both the MS0 and 1 of the neutral map for the first test. Then you should just be able to put the bike in neutral and wind it out and see how the STV moves. Excellent. I didn't realize there might be a map for this, I was thinking the secondaries opened a fixed percentage across the board for a given throttle opening. Not sure where I got that idea from. I'll give this a try tonight. I'll also do 100% in 1st of MS0 (but not MS1) so after checking out the STP in neutral we can also see which is the default MS. I changed the maps to 100% in all positions for MS0 Neutral and first gear, and for MS1 Neutral and second gear. The secondary butterflies opened 100% in Neutral at all RPMs but closed down while in any of the gears. I could not see the flies at higher RPMS in gear due to having a hand on the clutch and throttle, but based on sound alone it appears the flies are not opening any differently than stock. I retested with a stock ECU and the flies were closed in neutral just like while in gear. So, the changes to the neutral maps worked but the gears did not. Do you think it defaults to a certain map (say 1st in MS1) when the clutch is pulled in or the bike is not fully warmed up? I guess the next step is for me to change the rest of MS0 to 100% and remove the changes to MS1. Then depending on the neutral condition, we'll know which map it's using, and assuming it's MS0 I'll also be able to see if the flies open in gear with all the maps set to 100%. Well at least we know we're in the ballpark. Usually Clutch in is treated the same as neutral. I would have expected the the flies to go 100% (with your modified neutral maps) with the clutch in. You could go the other way on the maps too...put the maps at all 10% then if the bike runs like crap off idle you'll know your on a custom map. With all the MS0's at 100% and the MS1's at 10%, the secondaries opened 100% and stayed there in all gears with a cold engine and the clutch in. The default maps are therefor MS0. I'm still not sure why the secondaries did not open 100% when I first set the 1st gear map to 100%, unless the maps are for conditions rather than gears. I rechecked the bin in romraider and I definitely had the first gear map set at 100%. When I have time, I'll test each map and see if there any changes with the engine warmed up or the clutch switch bypassed. I can add a switch on the Map Select ground so I can try two maps at once with each flash to speed this up. In neutral the STVs opened 100%. In any gear cold they shutdown regardless of the clutch switch position. Once warmed, same results. Cutting the MS ground, neutral shutdown. That proves the MS switchover is working. While warm, in all gears, regardless of clutch switch position the STV stayed closed. Have yet to test once the motor cools down, but I don't expect any change. One thing is for sure - looking at the map settings the stock STV action at higher RPMS was clearly designed to reduce power on this bike. Changing these maps will yield substantial free horse power, and without the loss of torque or addition of bog at lower rpms caused by physically removing the STV plates. Looking at the ignition maps for cylinders 1 and 4, it looks like they did the same reduction thing there. I can't wait to change that...maybe copy the map from 2 or 3 to 1 and 4? Other than de-tuning, what kind of reason would there be for the ignition maps to be *substantially* different?